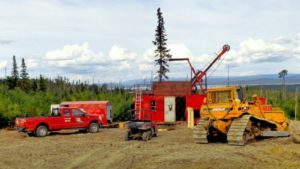 : Exploring the Lac Gueret Project in northern Quebec. Source: Mason Graphite Inc.
Mason Graphite Inc. [LLG-TSXV; MGPHF-OTCQX] shares were active Wednesday December 5 after the company released an updated feasibility study and economic results for its Lac Gueret Project in northern Quebec, where pre-construction work is underway. The initial capital expenditure for the project is now forecast at $258.2 million. Average annual production over a 25-year mine life is expected to be 51,900 tonnes at an average cost $484 per tonne. That compares to a selling price of $1,933 per tonne. The internal rate of return (IRR) is now pegged at 27.7% pre-tax, and 21.7% post-tax. Mason Graphite shares advanced on the news, rising 3.51% or $0.02 to 59 cents in early afternoon trading on Wednesday. The 52-week range is $2.87 and 62 cents. “This update demonstrates, once again, that our project remains financially very robust and is becoming a reality at the dawn of an imminent and unique growth period for natural graphite, driven by the Li-ion batteries and electronic vehicle revolution, expected in a few years,” said Mason Graphite President and CEO Benoit Gascon. Mason is a graphite mining and processing company focused on developing the Lac Gueret Project in northern Quebec, where the graphite grade is believed by management to be among the highest in the world. The Montreal-based company recently received the governmental authorization, via the issuance of Decree 608-2018 by the Quebec Government. Under the Quebec Environmental Quality Act, this government authorization is the main permit required prior to commencing construction activities for both the Lac Gueret and Baie-Comeau sites. It governs the other governmental permits required to proceed with the construction and operations of the project. In January 2018, Mason Graphite secured a portion of the construction financing by raising $45 million from a private placement offering of 18.75 million shares priced at $2.40 per share. Gascon said the company is completing the detailed engineering, has started receiving equipment, and has begun pre-construction work at the site. According to an amended technical report, which was announced on March 1, 2016, Lac Gueret is host to proven and probable reserves of 4.7 million tonnes, grading 27.77% graphitic carbon. That is in addition to a measured and indicated resource of 58.1 million tonnes, grading 16.30% graphitic carbon. “The Certificate of Authorization is a milestone of the utmost importance for our project and I would like to sincerely thank everyone who has been involved in the process,” said Gascon. “[Receiving] the Certificate of Authorization is another telling sign of its social acceptance by the local communities and the Innus of Pessamit,” he said. The Lac Gueret Project being located within a territory designated as the Manicouagan-Uapishka Biosphere Reserve. This approach was highlighted by an exemplary mention made by the Canadian Commission for UNESCO external review committee and Mason Graphite’s contribution to sustainable development, the company said.